To work with a test store and a test Wallet, use demomoney.yandex.ru instead of money.yandex.ru. Register a separate Yandex username for testing payments, to avoid mixing up test payments and real ones. 2. 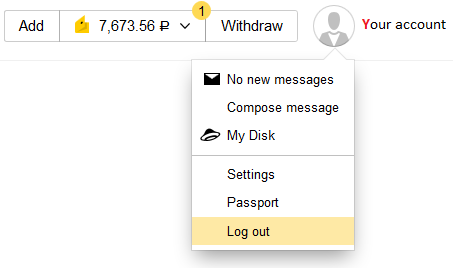 If you have already logged in, click your Yandex username in the upper-right corner of the page, then select Log off in the drop-down menu. 3. 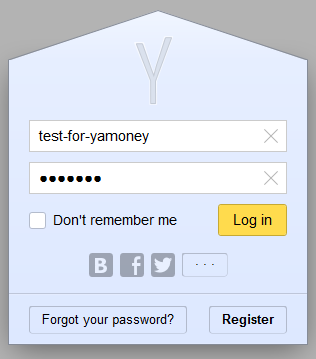 You will see the login page for the Yandex.Money test Wallet. Click Open a Wallet. 4. Enter data for registering the test Wallet. The phone number you entered during registration will be used for payment authorization when paying from the Wallet. 1. Go to demomoney.yandex.ru. If you have already logged in, click your Yandex username in the upper-right corner of the page, then select Log off in the menu. 2. You will see the Yandex.Money Wallet login page. Click Log in. 3. In the popup window, enter the username and password of your test Wallet, then click Log in again. 4. Now you are logged in. 1. Log in and go to https://demomoney.yandex.ru/shop.xml?scid=50215. 2. You will see the deposit form. Enter the number of the test wallet and the amount. Click Pay. To find your Wallet number, expand the balance section in the upper-right corner of the page. 3. Now your account has been credited. Look at the sample source code of an HTML page with the simplest form and minimal parameters. 1. Create an empty file with the HTML extension. 2. Copy the sample of the payment form code to it, change the values of the shopId and scid parameters, and save the file. If the store is activated using a ready-made CMS or other solution, this form is already embedded on your site. You only need to change the settings. To do this, go to the payment settings for the Yandex.Checkout module, enter the necessary parameters, and switch the module to testing mode. 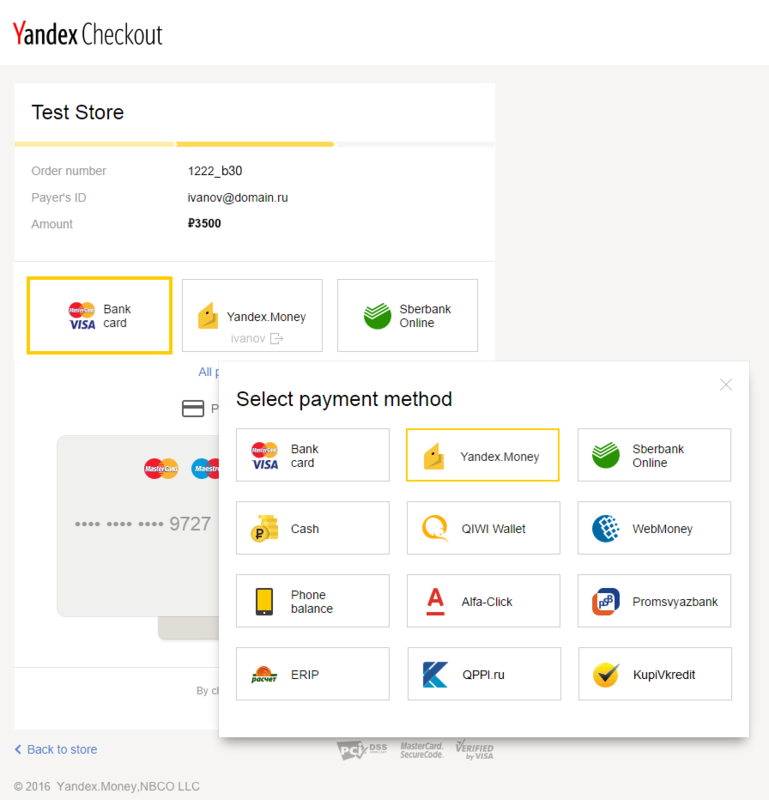 For instructions on installing and configuring the payment module, see the Settings section on the Yandex.Checkout website, or ask the developers of your system for help. 1. Open your test payment form. If you created the form manually, open the HTML file in a browser. If you configured a payment module, place an order as if you were a customer and proceed to payment. 2. Select the payment method and click Pay. The payment method is selected on the store's website or on the Yandex.Checkout side (this depends on the payment scenario). 3. You will see the appropriate confirmation page, depending on the selected payment method. Enter required data (wallet number, card number, CVV code). The addresses of Yandex.Money test pages always begin with demomoney.yandex.ru. The payment confirmation pages should show the name of your store or legal entity. 4. Confirm payment (enter the text message password). 5. You will see a page with the payment results. 6. If your store gets HTTP notifications (activated using the HTTP protocol or a Payment module), make sure that the order is marked as paid in your system. If your store gets email notifications (it is activated using the Email protocol), make sure that you received a message with payment information. 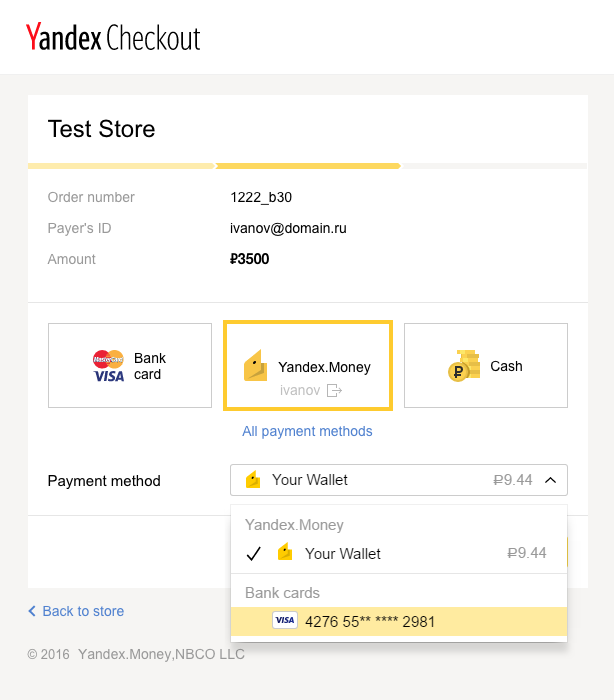 If all the test payments were processed successfully and you received notifications in the correct format, please inform the Yandex.Checkout technical specialist and the manager responsible for activating your store. They will check that everything is working correctly and will activate your store for receiving real money. Get a new value for the scid parameter. 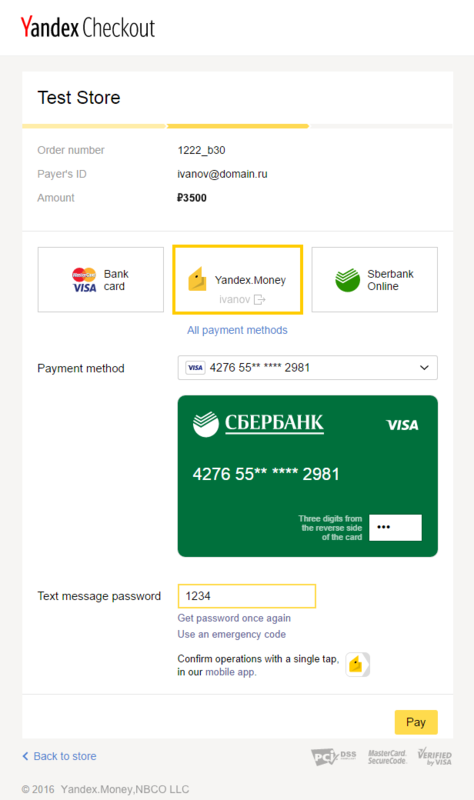 Change the address in the payment form for sending parameters to https://money.yandex.ru/eshop.xml. For stores using a CMS or other ready-made system, instead of changing the address, you need to turn off testing mode in the payment module settings.